Transcript, a photo, and additional notes follow below. From the Cumberland Gap to the Atlantic Ocean, this is Virginia Water Radio for the week of January 5, 2015. This week, travel back in time—for about 17 seconds—to Richmond in January 2014. With those or similar words, the Virginia General Assembly convenes in Richmond each year on the second Wednesday of January. During their annual sessions, the 100 members of the House of Delegates and the 40 members of the State Senate consider several thousand bills, many of which deal with subjects related to water, like fisheries [FISHING LINE SOUND], wildlife [BEAVER TAIL SPLAT SOUND], boating [MOTOR SOUND], drinking water [HOUSEHOLD FAUCET SOUND], and energy [POWER LINE SOUND]. But this sound [COINS SOUND] symbolizes the main event of many General Assembly sessions—the state budget. The state government operates on a biennial budget, covering two fiscal years. In even-numbered years, the General Assembly sets the budget for the upcoming two years; the Assembly considers amendments to that budget during sessions in odd-numbered years. Each year in December, the governor submits a budget proposal, and in January separate budget bills are taken up by each house. After each house passes its own budget bill, a joint conference committee sorts out differences between the two versions. Once both houses agree on a final bill, that bill goes to the governor, who may approve it, veto it, veto parts of it, or seek amendments. Any vetoes or amendments go back to the General Assembly in a reconvened, or “veto,” session in April. Every year, the General Assembly passes lots of bills on lots of issues, but legislators’ decisions about whether or not to "select your method of payment" [GROCERY STORE SELF-CHECKOUT SOUND] often have the biggest impacts that follow final adjournment. The excerpt from the Virginia General Assembly heard in this episode was recorded from live-streaming of the General Assembly’s opening House of Delegates session on January 8, 2014, accessed at http://virginia-house.granicus.com/ViewPublisher.php?view_id=3 in January 2014. The fishing line sound was taken from “Bass Fisherman’s Reel” on the 2004 CD “Virginia Wildlife,” copyright Timothy Seaman and Pine Wind Music, used with permission. More information about Timothy Seaman is available online at http://timothyseaman.com/. Information on the General Assembly is available from the Assembly’s Web site, http://virginiageneralassembly.gov/. That site offers several useful features, including member lists, session calendars, links to the live video of floor sessions, and information on legislative processes. Information on the Virginia state budget process is available from the Department of Planning and Budget, online at http://dpb.virginia.gov/budget/budget.cfm. The Virginia Legislative Information System, at http://leg1.state.va.us/, is the online location for following the legislation of General Assembly sessions. For water-related bills in the current and previous sessions of the General Assembly, please see the Virginia Water Resources Research Center’s “Virginia Water Legislation” page, online at http://www.vwrrc.vt.edu/virginia-water-legislation/. Committees and subcommittees play key roles in the progress of legislation in the General Assembly. The General Assembly’s standing (or permanent) committees are listed online at http://leg1.state.va.us/121/com/COM.HTM. That site provides links to each committee; in turn, each committee’s online page provides a list of members, agendas, reports, and legislation on the committee’s docket. If you know the numbers of your legislative districts, you can also use the following code to identify your representatives’ Capitol phone numbers: for delegates, (804) 698-10 + district number (for example, 698-1003 for the District 3 delegate); for senators, (804) 698-75 + district number (for example, 698-7510 for the District 10 senator). The Lobbyist-In-A-Box subscriber service also offers free tracking for up to five bills, and it offers tracking of more than five bills for a fee; visit http://lis.virginia.gov/h015.htm. For assistance, phone Legislative Automated Systems at (804) 786-9631. 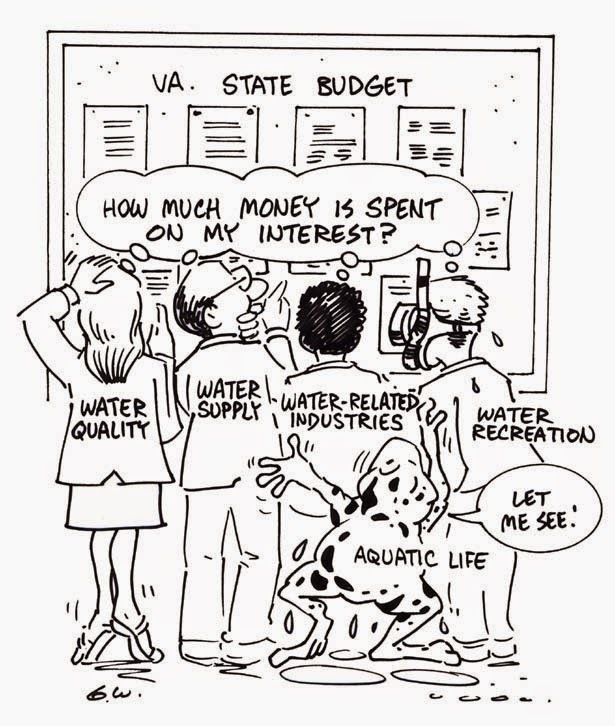 For an introduction to water-related spending in the Virginia state budget, please see “Inside Virginia’s State Budget for Water,” Virginia Water Central, April 2001, p.1; available online at http://www.vwrrc.vt.edu/water-central-news/ (click on the link under “Newsletter Archives”). The article is somewhat dated now, of course, but it retains a good deal of useful, basic information on Virginia’s budget process and on how different water-related functions are distributed among different agencies. A slightly later overview of the budgets of Virginia’s agencies with water responsibilities is available in the January 2004 issue of Water Central, p. 18 (see the same link for access). Virginia Water Central News Grouper posts on news, events, and information resources relevant to the Virginia General Assembly are available online at http://vawatercentralnewsgrouper.wordpress.com/?s=General+Assembly. Episode 143, 1/7/13 – Music for the Past and Present of the Virginia General Assembly. Episode 147, 2/4/13 – Committees Guide the Flow of Bills in the Virginia General Assembly. Episode 196, 1/13/14 – The Virginia General Assembly on its 396th Opening Day, January 8, 2014. This episode may help with Virginia’s 2010 Science Standards of Learning (SOLs) for Grade 6 (particularly 6.7, 6.9), Life Science (particularly LS.4), and Earth Science (particularly ES.6 and ES.10). It may also help with Virginia’s 2008 Social Studies SOLs in Civics and Economics (particularly CE.1, CE.7, and CE.9), World Geography (particularly WG.7), and Government (particularly GOV.1, GOV.8, GOV.9, and GOV.16).